Bipolar depression treatments cause a lot of confusion. This is because the best treatment for a serious episode of bipolar depression is different to the best treatment for serious bipolar mania. When we say “bipolar treatments,” we first and foremost mean bipolar medications. For example, Lamictal is very effective as a bipolar depression treatment, whereas lithium is more effective for treating bipolar mania. Abilify is an example of a drug that is approved for treating mania, but NOT BIPOLAR DEPRESSION. 1. Treating episodes of bipolar depression requires different strategies to treating unipolar depression. Some medications are much better for treating either bipolar depression or bipolar mania, but not necessarily both. 2.Regular antidepressants such as SSRI drugs like Prozac are not particularly effective for treating bipolar depression, PLUS they can cause a person to “flip” into mania. 3. Most people with bipolar disorder spend MUCH MORE time being depressed than they do being manic. great many people are misdiagnosed), sooner or letter you will also experience an episode of depression. A new drug for bipolar depression called Latuda (generic name Lurasidone) was approved for treating Bipolar I depression by the FDA in July, 2013. Lurasidone is a powerful antipsychotic that has serious side effects, especially in relation to weight gain and likely contributing to diabetes and heart disease. However, it is less potent for weight gain than almost all of the other atypical antipsychotic drugs and, in comparative terms, has a more benign side effect profile. The combination of Lamictal and lithium is emerging as a “gold standard” in bipolar maintenance treatment because it achieves an effective balance of treating both poles of the illness. Of course, there is more to treating bipolar disorder than medication! Cognitive behavioral therapy (CBT) and other forms of “talk therapy” have been shown to help. Also, educational oriented therapy that informs people about bipolar disorder and the need for medication is known to improve outcomes. However, the big news is the effectiveness of Interpersonal and Social Rhythm Therapy (ISRT) or simply Social rhythm therapy. This emphasizes following a regular daily routine of beneficial practices such as regular sleeping hours, daily exercise, scheduling daily activities for every day, and maintaining a healthy diet on a daily basis. I KNOW YOU MAY NOT WANT TO HEAR IT BUT . . . We know that one of the most effective bipolar depression treatments is exercise. I know you may resist this but the science is now beyond doubt. Just do it! 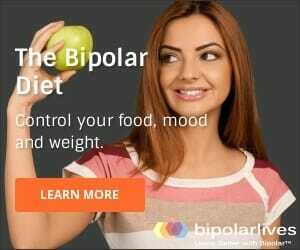 Another critical element is The Bipolar Diet. What else fights depression and makes people happier? 1. Gratitude – all you need to do is write down three things you are grateful for every day. This combats depression, increases optimism and was even shown to improve physical health. 2. Give – Even small acts of kindness are known to rapidly and significantly boost happiness. 3. Gloat – write down 1 – 3 things each day that have gone well. These do not have to big things – even sticking to your schedule counts. A common problem experienced by people with bipolar disorder is that they may have been under medical care for a while and are taking medication, but are still depressed. Sometimes it is due to poor medication compliance. If someone isn’t taking ALL of their medication at the RIGHT DOSE AND THE RIGHT TIME, then they very likely to experience mood swings, including episodes of depression.